This is something I performed and documented on my MM4. I posted on TGP, but since it is down---I figured I would pass the knowledge on here. 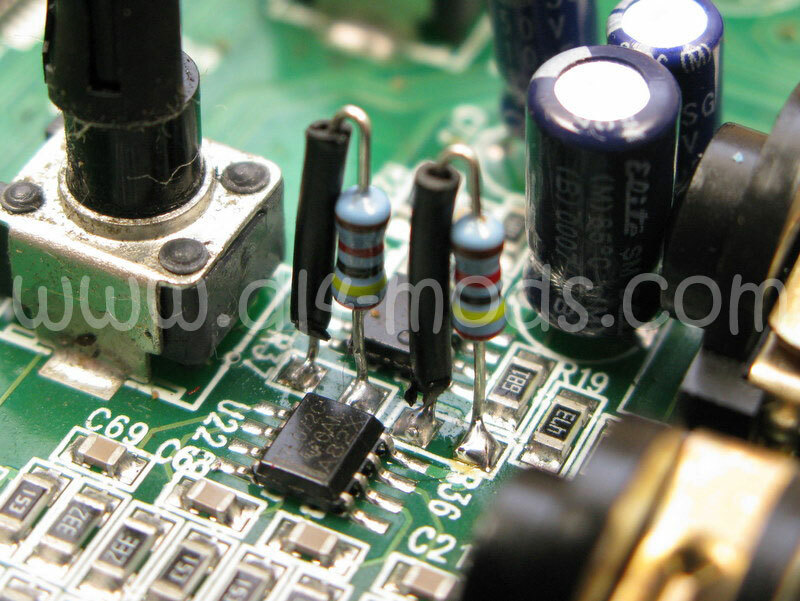 Nichicon and WIMA; Remove TL072 op-amps (U3 and U22) and replace with Burr Brown hi-fi OPA2134UA. C36, C23, C24) in order to make the pedal TRULY true bypass and eliminate tone sucking. 3) Reduce R36 and R37 from 36k to roughly 22k (24k according to Jeorge Tripps) for increased gain of output buffers. This will fix the "volume-drop" problem some people experience. #2 and #3 are crucial to do. 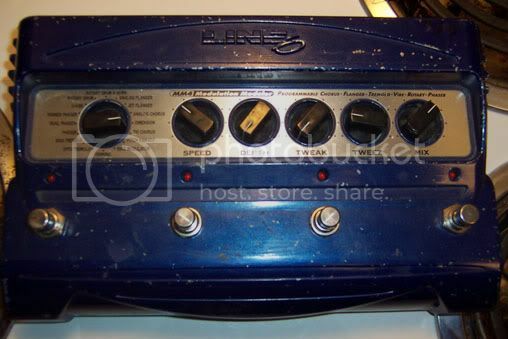 #1 is just for tone snobs. Furthermore, #2 was caught pretty early in the revision history so pedals built after 2001 already have this implemented. STEP 1: Take your pedal apart! Here is my road beaten MM4. Actually, I bought it used (aka pre-beaten) off of EB*Y. After taking the screws off the back, your pedal should look like this. Slide the battery clips out. Then remove the 4 black screws. Then remove the silver retaining screw/nut in center. 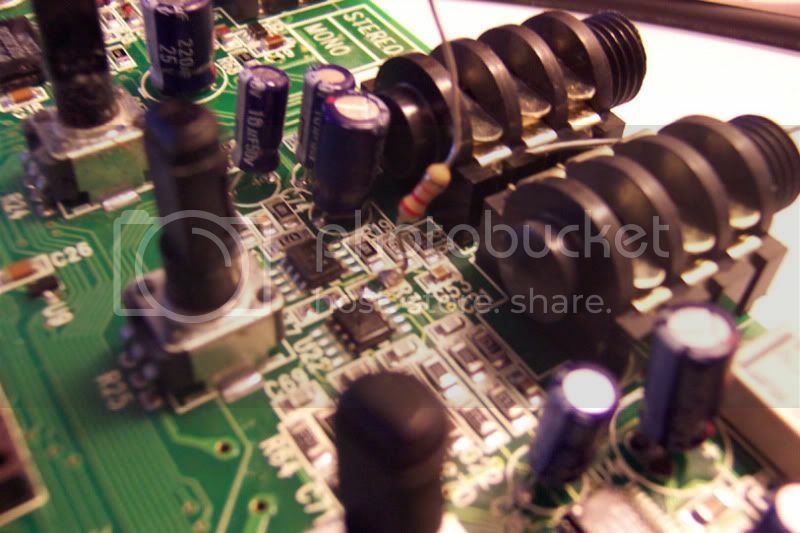 Remove nuts from input/output jacks. This is what you should have left. This is the part you have to work on. Now turn it over! STEP 2: SMT FUN or "How the hell do I remove these small components?" Desolder the resistors by heating up one end and quickly shoveling it off the PC board WITHOUT damaging the copper pads. STEP 3: Installing 22k resistors or "So this is how a square peg fits in a round hole." 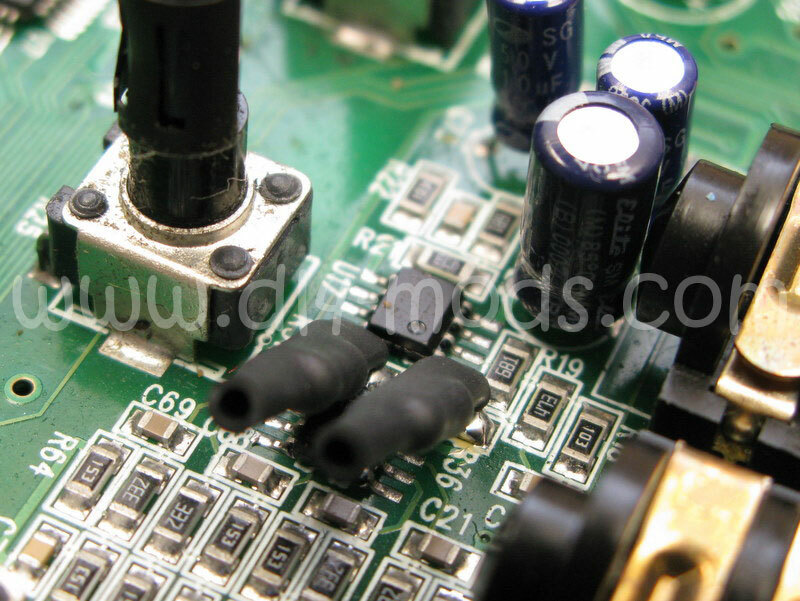 At this point, you notice there are no nice holes to run your resistor leads through. Some of you might get discouraged at this point, but you can make it work! 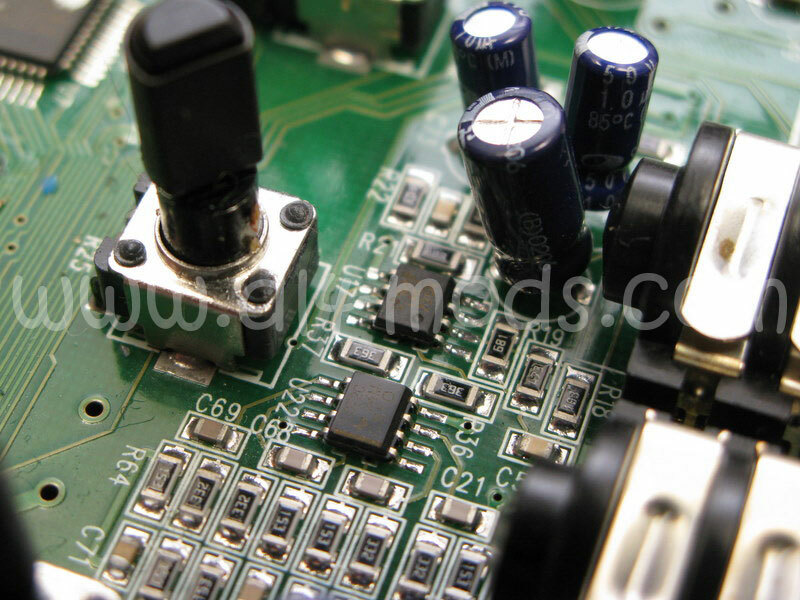 Take your resistor, make a small 'L' at the end of the lead, and solder the 'L' to the pad. Make another L fold over the resistor. I used some heat shrink to prevent contact with the next resistor that you have to wrangle on. Repeat this step for R37. I tested mine, and NO MORE VOLUME DROP! Hopefully this helps everyone. "When the going gets weird...the weird turn pro." Is C8 right above C4? 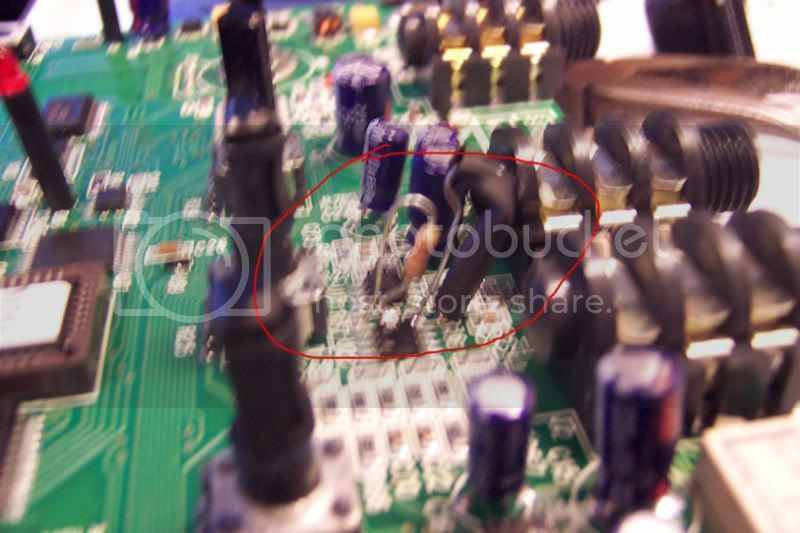 Are the replacing op-amps supposed to be surface mount? If not, how do you, did you, attach the legs to the PCB? C36, C23, C24? Only units older than 2001 will have that, and those components can be removed for an improved signal? The only thing I did was fix the volume drop using non-SMT components. You would need to get the SMT Burr-Brown. I did not remove C4 or C8. C4 and C8 are the two electros right near the second to last jack on the right in your pic - what should be the Right Input jack. C4 is on the bottom and C8 is above it almost touching the bottom left of the Right Input jack..? 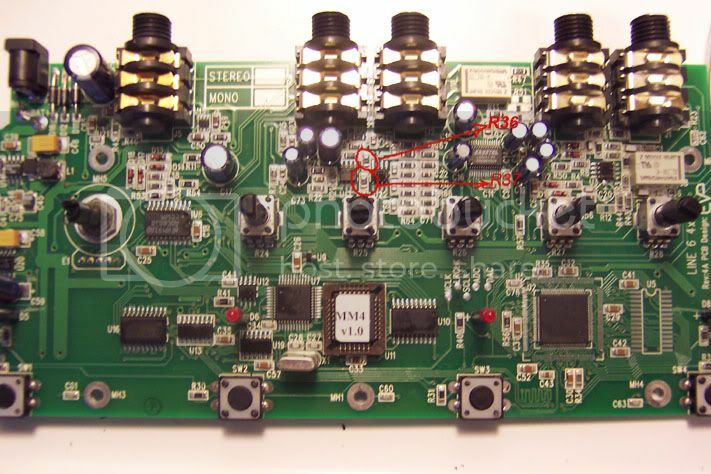 I like to do step 3 but i dont know how much watts the resistors need to have? What resistors can i use? Metall or the other ones? There's a guy here who does a bunch of mods to the DL4. His name is drasp. He does good work if any of you don't want to mess around with your pedal's guts. You'd probably want to use 1% metal film 1/4W parts. Be sure before you go soldering to SMT pads that you're comfortable with your iron & technique. Of all the mods in the DIY kit I sell, this is the only one folks have had trouble with. If you can, find a used/dead PC motherboard or something similar to practice with - EASY once you've got 'the touch', but deadly (to the PCB) if you don't. 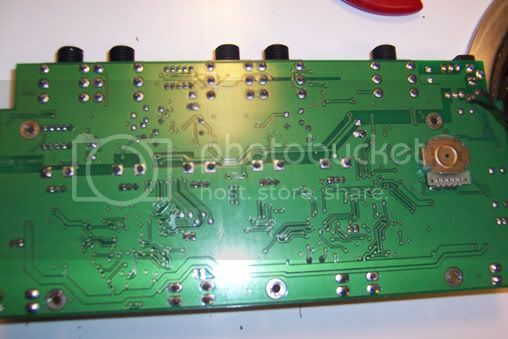 * DL4s * DIY Kits * Anyone with information about Steve Gibbs of the Audio Bros. please contact me! Then, I like to slip another piece of heat shrink over the top & bend them gently over. . .
For those looking to get super-fancy, you can get a warm air reworking station on Amazon for <$100 & replace the stuff with the right SMT parts. Sorry nobody had replied to your post! I was linking someone to this thread as a reference & just saw. You don't replace them, just remove them. Most pedals won't have them in the first place, just check to see if they're present on your board. If they are, you're in for a nice treat as the bypass is improved w/o them. Does anybody know what the value of R31 is?...My soldering tip took it off by accident! Sorry I hadn't gotten back to you yet - sometimes slow to respond to PMs. R31 (next to switch 'C') should be 4k. Its a 1% part marked 4021 (4.02k). FYI - if you want more info on replacing surface mount parts, you can read THIS. How do you rewire the foot switches with momentary ones?